TNT Barrels (originally called TNT Drums) are barrels found in the Donkey Kong franchise. Like normal barrels, TNT Barrels can be picked up and thrown as a weapon, but will explode upon contact with an enemy, the floor, or a wall. The fiery explosion of a TNT Barrel will defeat every enemy caught in the blast radius. TNT Barrels help defeat tough enemies, such as Zingers, which cannot be directly attacked, and can also reveal hidden bonus rooms in many levels. In most games, a TNT Barrel looks like a regular barrel with a fuse and the abbreviation "TNT" painted in white on the front. However, in Donkey Kong 64, they are considerably smaller and red-colored. A TNT Drum appears for the first time in the opening scene of Donkey Kong Country. Cranky Kong uses it to wreck Donkey Kong's boom box, as retaliation for Donkey Kong knocking him out of the trees and ruining his phonograph. During gameplay, TNT Drums can be lifted, then tossed on the ground or a wall to explode, defeating any enemy standing in its explosion range. They can also be utilized this way in the sequels, as well as in the Donkey Kong Land games, though in the latter, their explosion range appears to be smaller. However, only in Donkey Kong Country, if a Kong picks up a TNT Drum and puts it down, it will start to shake and self-destruct shortly after. The Kongs will not get hurt if they rapidly head into the blast of a TNT Barrel after it was thrown. On the other hand, if the barrel is lifted and put back down, then blows up on its own as mentioned earlier, it can harm the Kongs. Some Kremling enemies have been known to hide in TNT Barrels and act as suicide bombers, sacrificing themselves in an attempt to destroy the Kongs. These include Kabooms from Donkey Kong Country 2: Diddy's Kong Quest, as well as Krackas and Klasps found in Donkey Kong Country 3: Dixie Kong's Double Trouble!. Other Kremlings, namely Bazukas, may shoot TNT Barrels out of their cannons, and the Kongs would have to avoid them. In Donkey Kong 64, TNT Barrels are colored red and mostly used against bosses, such as Army Dillo and Dogadon. Kabooms from Donkey Kong Country 2 return in this game, hiding inside TNT Barrels with no fuses. TNT Barrels also appear in DK: Jungle Climber. They can be used to destroy dense objects around them, and will explode if attacked. 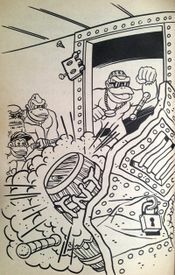 Illustration showing the Kongs breaking Funky Kong out of his prison cell, by using a TNT Barrel. In Donkey Kong Country: Rumble in the Jungle, miniature TNT Barrels (stylized as mini-TNT Barrels) are used by Donkey Kong on several occasions throughout the novel. Before the Kongs leave their treehouse to travel to Big Ape City, Donkey Kong takes a backpack full of miniature barrels, including some that "could even explode". TNT Barrels are first used while the Kongs are battling some Kremlings and their barrel cannons in Tree Top Town. Donkey Kong launches several TNT Barrels by slinging back a tree branch, allowing the barrels to reach high above in the tree tops. Donkey Kong later uses one to break open Funky Kong's prison door within the Kremling's factory in Big Ape City, although the sound of the explosion attracts Kritter and a group of Kremlings. Donkey Kong later uses a TNT Barrel to destroy the defense system's control room, and then again later to create a hole in the factory wall so that the Kongs are able to escape in Funky's barrel plane. While in the plane, Donkey Kong and Diddy Kong decide to jump from the plane to infiltrate King K. Rool's zeppelin. They plant the zeppelin with many time-delayed TNT Barrels, and they escape to watch it fall on top of the Kremling's factory, which causes a powerful explosion. 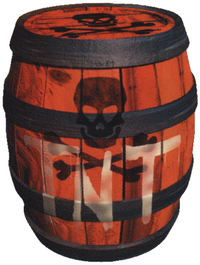 An illustration shows that the TNT Barrels resembles their artwork for Donkey Kong Country, although lacking a fuse at the top. And despite the novel claiming to describe "miniature" TNT Barrels, their illustrated size in proportion to the prison door appears to be closer to a regular-sized barrel. An Exploding Barrel from the episode Booty and the Beast. A barrel similar to TNT Barrels appears in the Donkey Kong Country animated series. Here they are referred to as Barrel Bombs or Exploding Barrels and bear a resemblance to Auto-Fire Barrels. They are seen during the first half of Booty and the Beast, where King K. Rool takes over Bluster’s Barrel Works and begins manufacturing exploding barrels. However, Donkey Kong chased off K. Rool and production was halted. In Kong for a Day, K. Rool made a second attempt to seize control of the Barrel Works to manufacture more exploding barrels, but this time Donkey Kong foiled his plans before production could commence. While K. Rool possesses these barrels, he never directly uses them against the Kongs. 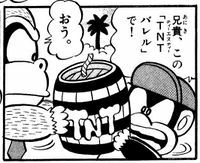 The TNT barrel makes an appearance in Super Mario-Kun in issue 14. During a fight with Army, Diddy Kong gives Donkey Kong a TNT barrel. Donkey Kong then hurls it, only to have it explode on Mario and Yoshi while defeating Army. Mario then yells at Donkey Kong. In several places of the course DK Jungle course from Mario Golf: World Tour, TNT Barrels lie on the ground. They explode when a golf ball bumps into them, sending the ball high up to the sky. TNT Barrels are found near Hole 3, Hole 4 and Hole 9. TNT Barrels appear exclusively in the Mario + Rabbids Kingdom Battle Donkey Kong Adventure DLC, where they are used to defeat the health pool and Mega Rabbid Kong during his first boss fight. ↑ Donkey Kong Country 3: Dixie Kong's Double Trouble! instruction booklet, page 24. This page was last edited on March 26, 2019, at 22:48.